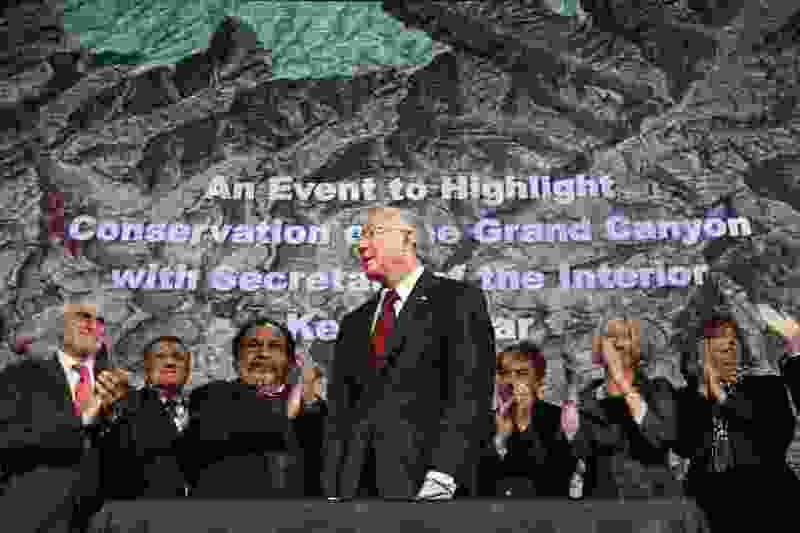 (Jacquelyn Martin | AP Photo) In this Jan. 9, 2012 file photo, then Interior Secretary Ken Salazar, center, standing in front of a map of the Grand Canyon, is applauded after announcing a twenty year ban on new mining claims near the Grand Canyon in Washington. A federal appeals court has revived a challenge to a company's right to mine uranium near the Grand Canyon. The 9th U.S. Circuit Court of Appeals on Thursday, Oct. 25, 2018, said a lower court must determine whether the U.S. Forest Service erred in finding that Energy Fuels had a valid, existing right to mine outside the national park's South Rim entrance. Environmentalists and the Havasupai Tribe had challenged the Forest Service's decision. Flagstaff, Ariz. • A federal appeals court has revived a challenge to a company’s right to mine uranium near the Grand Canyon. An Obama-era decision prohibits new mining claims on roughly 1,562 square miles outside the boundaries of the national park through 2032. But that doesn't keep uranium companies with grandfathered claims from developing them. The U.S. Forest Service concluded in 2012 that Energy Fuels Inc. has a valid, existing right to mine near Tusayan, the gateway town to the Grand Canyon's South Rim entrance. The company is waiting for uranium prices to rebound before reopening the Canyon Mine. Environmental groups and the Havasupai Tribe challenged the Forest Service's determination in a lawsuit against the agency and Energy Fuels. "As opposed to saying 'you don't have the right to make this argument,' it's affirmed that we have the right to make that argument," said Amber Reimondo, energy program director for the Flagstaff-based Grand Canyon Trust. Curtis Moore, a spokesman for Energy Fuels, said the ruling isn't a major setback for the company and he was confident it will prevail in the district court. "We don't perceive this as that big of a deal," he said. The Grand Canyon Trust, the Center for Biological Diversity, the Sierra Club and the Havasupai Tribe argue the Forest Service's review failed to consider the environmental and cultural costs of mining. "A prudent person wouldn't mine that resource if you're truly considering all the costs," Reimondo said. A spokeswoman for Kaibab National Forest, Liz Schuppert, said Friday the agency hasn't reviewed the 9th Circuit decision.